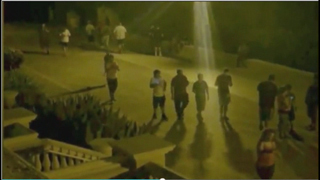 HOLLYWOOD, Fla. - A Hollywood condominium association is considering legal action to combat the throngs of "Pokemon Go" players who flock to the beachside building in the early morning hours. Lon Tabatchnick said his peaceful, serene slice of paradise at the Villas of Positano has recently been disrupted by hundreds of "Pokemon Go" players who infiltrate the private property. The Villas at Positano is a Pokestop for the popular game, and rare Pokemon are released at midnight Pacific Time, so at 3 a.m. hundreds of players make their way to the condo. "There (are) no public bath facilities here, so if they are here and they have to go to the bathroom, they tend to use the bushes," Tabatchnick said. "Garbage is deposited. Some people that late at night are intoxicated. They are loud." Tabatchnick said they also park illegally and stay for hours. Hollywood police are aware of the problem but said if they are on the Broadwalk and not causing a disturbance, they can't stop them. But not everyone follows the rules. Crystal Rios said she has caught many Pokemon -- some that were rare -- at the Villas of Positano, but she is aware of her surroundings. "If anything, the players need to have more respect for the people that live here," she said. The condo association is considering joining a class-action lawsuit or filing one of its own because the game's maker has yet to remove the location as a Pokestop. "They are just zombies walking around bumping into things," Tabatchnick said. The residents understand that players just want to "catch 'em all," so they want the company to take action immediately. "We are not against gaming," Tabatchnick said. "We just want it done appropriately."